Though best known for writing the Association’s infectious smash “Windy,” on these home demos Friedman is revealed not as a pop songwriter, but as a jazzy, abstract seeker of answers, love and vision. 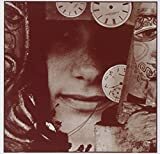 With her sad, husky voice and often convoluted imagery of nature and the human zoo, these rediscovered tracks evoke a tough yet sensitive hippie lady struggling to define herself, survive and occasionally triumph. The original demo of “Windy” swings nicely, “To Treat A Friend” haunts and “Southern Comfortable” is an intriguing period piece exploring American racism on the coasts and elsewhere. Don’t tune out before the closing tune, the fully orchestrated Tandyn Almer composition “Little Girl Lost & Found,” a psychedelic swirl of children’s book characters gone marvelously mad. The glossy booklet includes Friedman’s memories of each song and some evocative vintage snapshots.